We drove to Al Ain and from there we headed to Dubai. 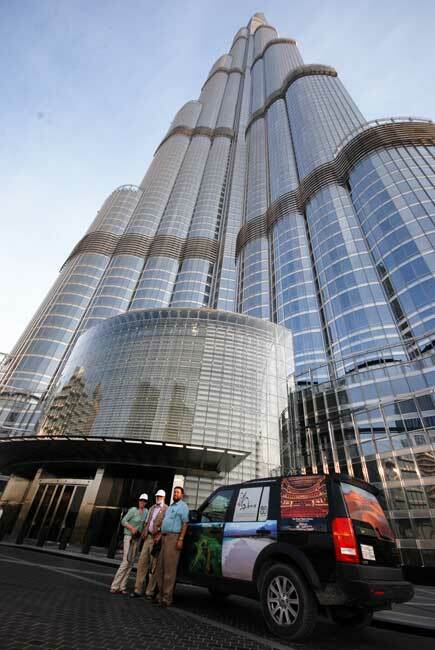 After checking in at our hotel, we had our lunch and then drove to Burj Khalifa, the tallest building in the world. What a sight, the place should be on any visitor's list. We had some photographs taken for the team with the car parked just in front of the tower. We also asked if we could visit the Armani Hotel located in the tower and the staff was very friendly and helpful. No visit to to Dubai is complete without visiting Dubai Mall and again here we saw people very interested in our vehicles. Dubai Mall, which has a state of the art aquarium, is always very busy – a strong indication that business is back to normal in Dubai, which reflects well on the emirate's leadership. Dubai is a special destination for a lot of people, but for us, we prefer Oman. Even residents of Dubai looking for a relaxing time and a change of pace will spend have a holiday in Oman, where life often feels like it hasn't changed in hundreds of years.